At some point, you’ll realize that you’re sending some generic emails to customers everytime you reply a message. 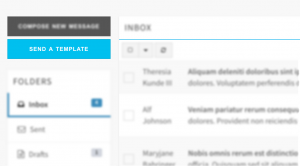 Email template module can help you to save lots of time. You can create email templates and send them directly to end users from your inbox section. Email templates can be in plain text or HTML markup text. You can also make some templates for vendors and also you may allow them to create their own email templates from vendor dashboard. To send a saved email template to choose to SEND A TEMPLATE when you send a compose a new message.